This guide will walk you through creating an EMDK For Android application that will use Barcode/Scanning APIs introduced in EMDK V 3.0, to perform Scanning operations on your Symbol Android devices without using Profile Wizard. The API uses Barcode Manager, which is the primary object to access barcode scanning feature. In this tutorial, we will explore the Barcode/Scanning API by using it for developing a basic application that will scan barcodes. Note: You don't need the Profile Wizard while using the Barcode/Scanning APIs as everything could be configured programmatically through code. Note: Provide "BasicScanningTutorial" as the project name for this tutorial. Modify the Application's Manifest.xml to use the EMDK library and to set permission for the EMDK to scan the barcodes. After that you also need to implement StatusListener for notifying client applications to notify scan events. Override its onStatus function. Finally implement DataListener for notifying client applications when the scan data is available. Override its onData function. We will now create some global variables to hold the instance objects of EMDKManager, BarcodeManager and Scanner. These variables would be used throughout the code. We will then add some UI elements starting with a TextView to display the status of scanning operation and then EditText to populate scanned barcode data. Now, let us design the simple UI that has a TextView to display the status of scanning operation and above that an EditText to populate scanned barcode data. So, remove all the code, inside "res/layout/activity_main.xml" and add following XML layout code for UI. Note: Press CTRL+SHFT+F or CMD+SHFT+F for indentation. In the onCreate method, we take reference of UI elements that are declared in "res/layout/activity_main.xml" in order to use them in our Activity. We then call getEMDKManager so that the EMDK can be initialized and checked to see if it is ready. // The EMDKManager object will be created and returned in the callback. We will write a method initializeScanner to initialize and enable the scanner and its listeners by using Barcode Manager object. The enable method enables the scanner hardware. This method does not make the scanner to scan or turn on the laser. Basically it will make the scanner device available for your application. If the same of scanner is enabled by other applications, this will throws ScannerExceptions. You must call disable() when you are done the scanning, otherwise it will remain locked and be unavailable to other applications. Once the barcode is enabled, we will call read method on scanner. The scanning API provides read method that starts an asynchronous Scan. The method will not turn ON the scanner. It will, however, put the scanner in a state in which the scanner can be turned ON either by pressing a hardware trigger or can be turned ON automatically. This is determined by the Scanner.TriggerType. The data notification must registered in order to scan and get the Scan Data. The read request can be canceled by issuing a cancelRead. If a read() is submitted while another read is pending, the method call will fail. It is recommended to check whether a read is pending by calling isReadPending() before submitting a read(). A read() can also be submitted from within onData and onStatus events. If called within onStatus, it should be called only when IDLE status is received. If called within onData, then checking for isReadPending() is recommended. Note: The read method allows you to scan the barcode only once. If you want to scan the barcodes multiple times then call read multiple times. Hence later in this tutorial, we will also call read in the onData callback method, which is executed every time a barcode is scanned. // press the trigger on the device after issuing the read call. // trigger or can be turned ON automatically. Now we need to use the onOpened method to get a reference to the EMDKManager. The EMDKListener interface will trigger this event when the EMDK is ready to be used. The EMDKListener interface must be implemented in order to get a reference to the EMDKManager APIs. This event will pass the EMDKManager instance and we assign it to the global variable emdkManager that we created in the earlier steps. We have used that instance to get an instance Barcode Manager to enable scanning. As mentioned earlier that whenever a barcode is scanned, its data will be received in a callback onData method upon data availability. So we need to get that data, process it in the format we want and populate in the EditText of UI. The received data should be processed on a background thread not to block the UI thread. Hence we will use Android's own AsyncTask to process the scanned data on background thread. So we create AsyncTask AsyncDataUpdate that takes ScanDataCollection, which has the scanned data. It then processes this object in doInBackground method to filter the barcode data and label type in strings, which is then passed to the UI thread in onPostExecute method of AsyncTask to Populate. As mentioned earlier we would call read method here in this callback so that the user can scan multiple barcodes. We call this AsyncTask in overridden onData method, by creating an instance of AsyncDataUpdate and passing the scanDataCollection for further processing. Whether we scan the barcode by pressing the hard scan key or keep it idle, it returns the status of the scanner at specific point of time in the overridden onStatus method of implemented StatusListener interface. Since we are also displaying the status along with barcode data, we will make use of this method and populate the status. Just like scanned data, we are also processing the scanner status on a background thread. Hence we will create another AsyncTask named AsyncStatusUpdate that takes StatusData and processes it in doInBackground method to retrieve state in string format which is populated in status Text View on UI thread in onPostExecute method of the AsyncTask. We call this AsyncTask in overridden onStatus method, by creating an instance of AsyncStatusUpdate and passing the StatusData for further processing. When we are done with scanning, we must release the scanner hardware resources for other applications to use. So override onStop method and disable the scanner to release it. Finally, Clean up the objects created by EMDK manager in onClosed method, if EMDK closed abruptly. That's it!!! 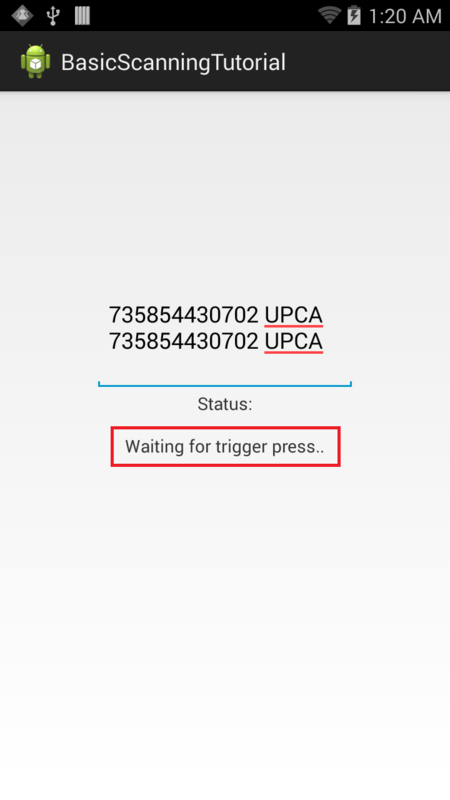 We are done with all the coding part that will let us scan the barcodes of configured decoder params on Symbol Android device using Barcode/Scanning APIs introduced in EMDK V 3.0. Now let us run the application. Connect the device (having latest EMDK runtime) to USB port. You can see a Toast, which indicates that the Scanner has been enabled and you can start scanning by pressing hard scan button of the device. 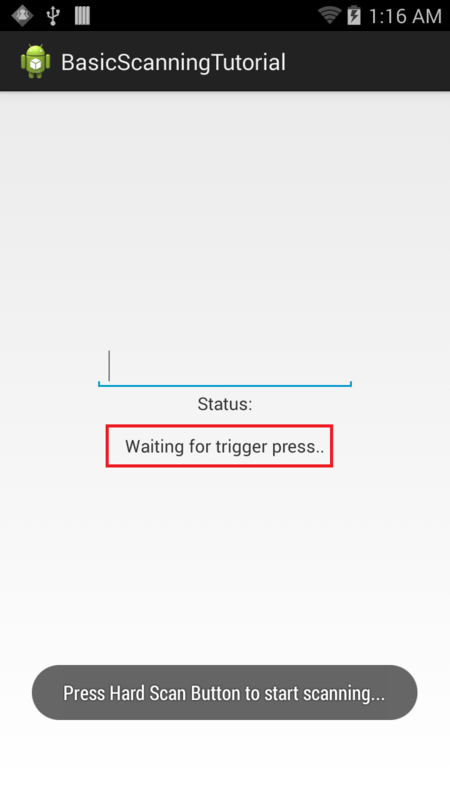 Now if you press the hard scan button, the status listener in the code starts working and current status of Scanner is displayed in Status TextView, which is Scanning. Once you are done with scanning and release the hard scan button, data gets populated on EditText and status is again updated in Status TextView, which is Idle. This is how Barcode/Scanning APIs introduced in EMDK V 3.0 can be used to perform Basic Scanning operations on your Symbol devices without using Profile Wizard. We will see the Barcode/Scanning APIs in depth to perform advanced scanning operations in the next tutorial. 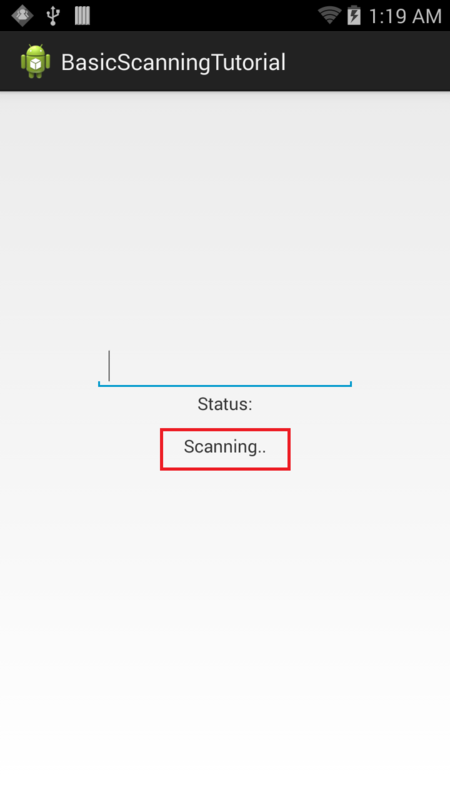 Now that you have learned how to perform Basic Scanning operations on your Symbol Android devices through applications without using Profile Wizard, let us try to understand the API in depth and perform some advanced scanning. So in the next tutorial, we will concentrate on Barcode/Scanning APIs in depth and use it to perform advanced scanning operations by creating a tutorial.